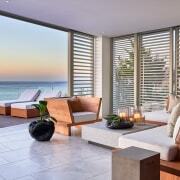 On Cape Town’s mountainside stands a striking angular building by renowned local architecture firm SAOTA. 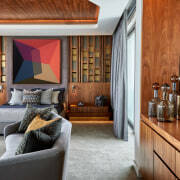 Complementing this terraced home, the interiors, by interior‐design leader ARRCC, are a treasure trove of gem‐like materials and custom furniture which pull together the client’s brief for ultimate comfort within high‐functioning entertainment zones. 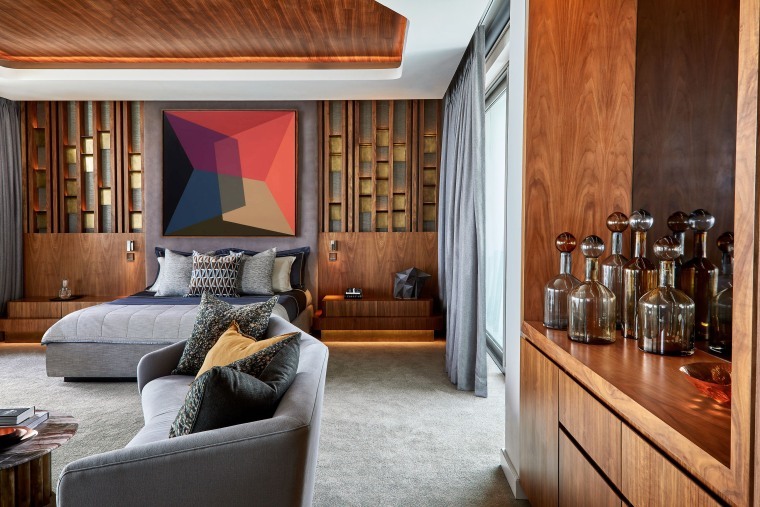 A profusion of metallic surfaces is juxtaposed with warm wood and splashes of bright colour, invoking a sense of dynamic living. 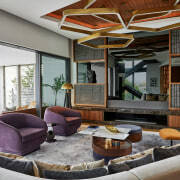 Each piece in this home invites closer inspection in its uniqueness. 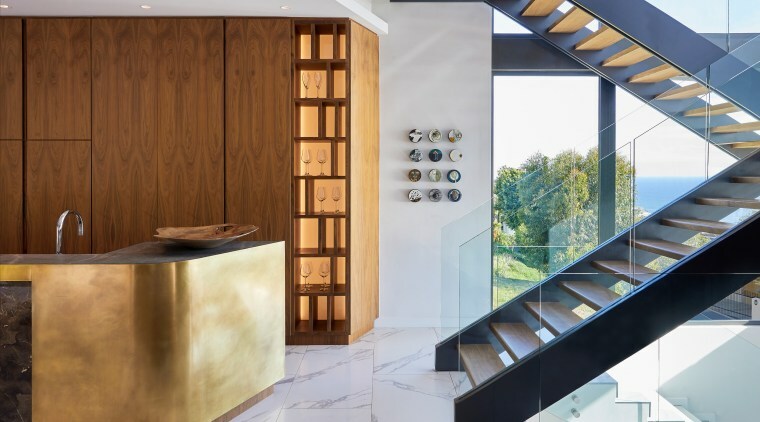 A double‐volume‐glass stairwell introduces mountainscape views. 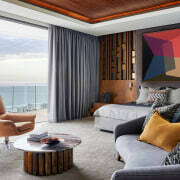 ‘It’s on the middle storey, however, the full effect of this entertainer’s paradise is appreciated,’ says ARRCC Director Mark Rielly of the living area. 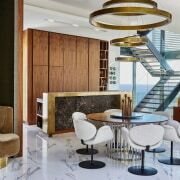 Reached via a double‐volume‐glass stairwell that introduces mountainscape views, the living area is a riot of calculated contrast, where light‐reflective metallics – polished, tarnished or patinated – hover above and surround precious marble and wooden surfaces. The living area is a riot of calculated contrast. 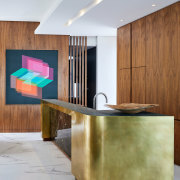 This is evident in the pared‐back kitchen, where a dark marble is inserted into a patinated brass countertop with granite work surface. 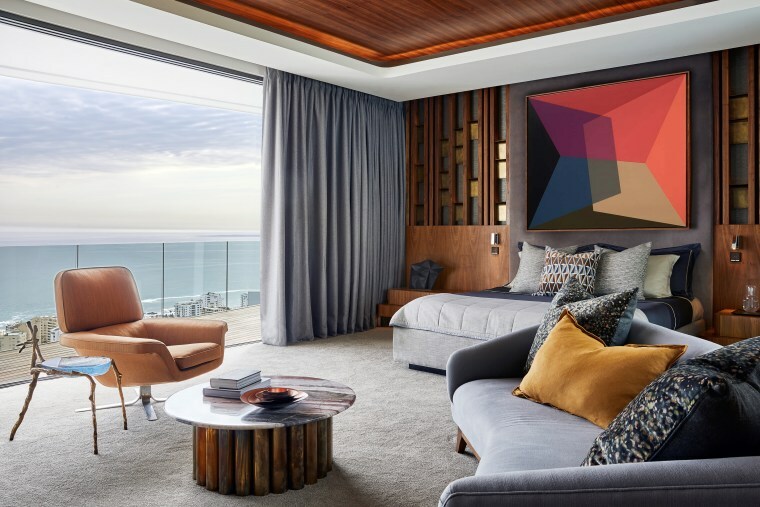 Brightened up with an optically abstract painting by Andrzej Urbanski from Everard Read, this area also encompasses the dining suite. 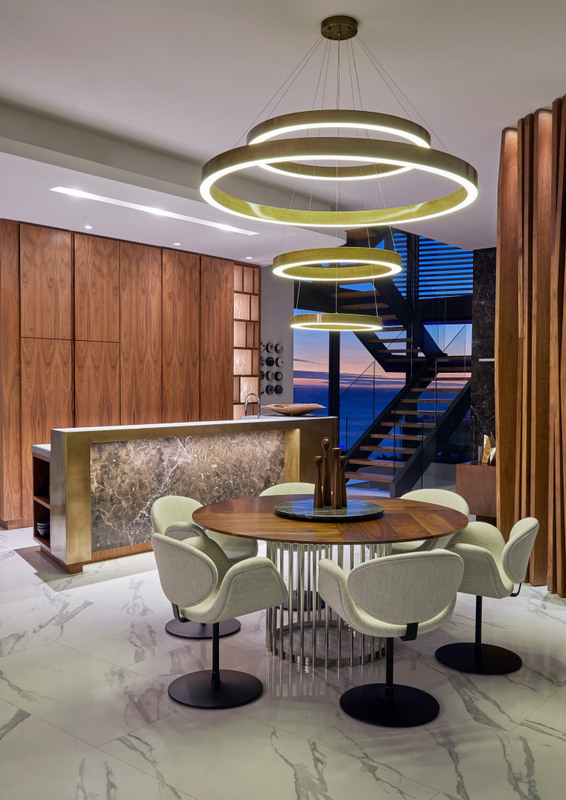 The walnut dining table was custom‐made with a marble lazy Susan and is surrounded by Arti‐forte chairs from Limeline that complement the table’s rounded form. Such circular shapes come to play in the sculptural light, too. 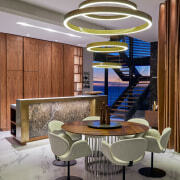 Brass rings cast a halo over the table, an atmosphere that is mimicked in the lounge with its polygon‐shaped light. The lounge allows for complete immersion. Separated from the dining area by architecturally slatted walnut screens, the lounge continues the dialogue of fascinating form. 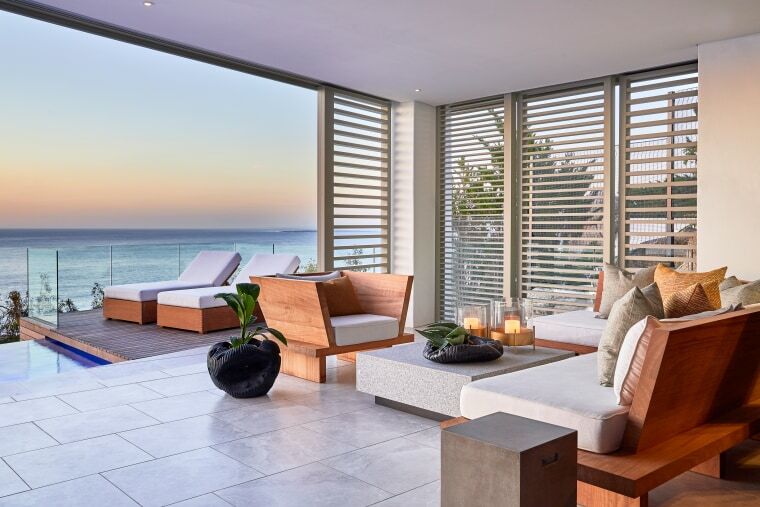 Its custom sofa, with angled bend, allows for complete immersion, offering views of the ocean, courtyard and television, which also acts as a mirror, further enhancing the sense of space. 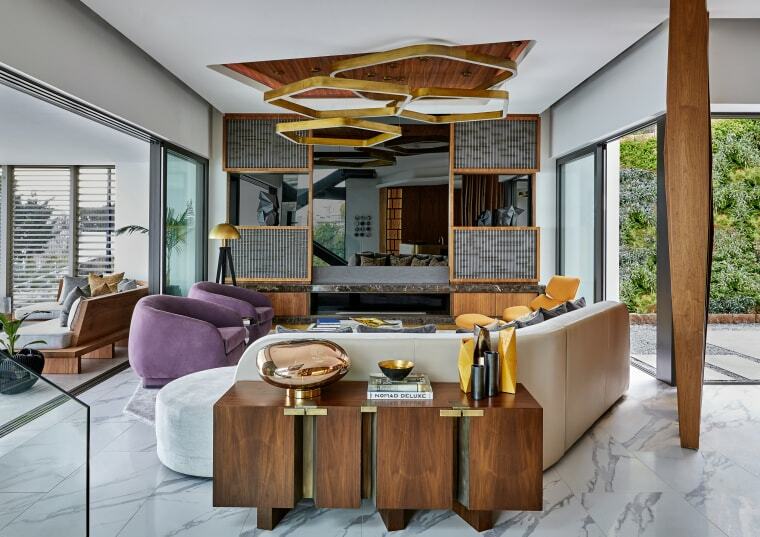 Two purple OKHA Gloob chairs, on either side of a Minotti side table, introduce colour to this otherwise muted area. 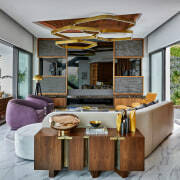 The custom‐made server and coffee‐table cluster create interest in their unusual design, with the Tom Dixon Melt lamp acting as sideboard sculpture, maintaining the metallic pops of attraction around the home. 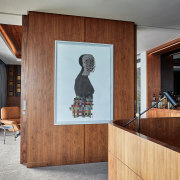 The combination of material and form is at its most condensed in the bar area. On the opposite end of this floor is the bar, a stylish nook for mixing drinks under Lee Broom hanging lights from Crema. It’s here that the combination of material and form is at its most condensed, with the slatted ceiling wrapping itself over the back wall, blurring into the wooden splash back that doubles up as illuminated shelving. 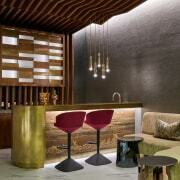 The bar itself is a custom structure, fronted by Pietra Paesina Laminam slabs. 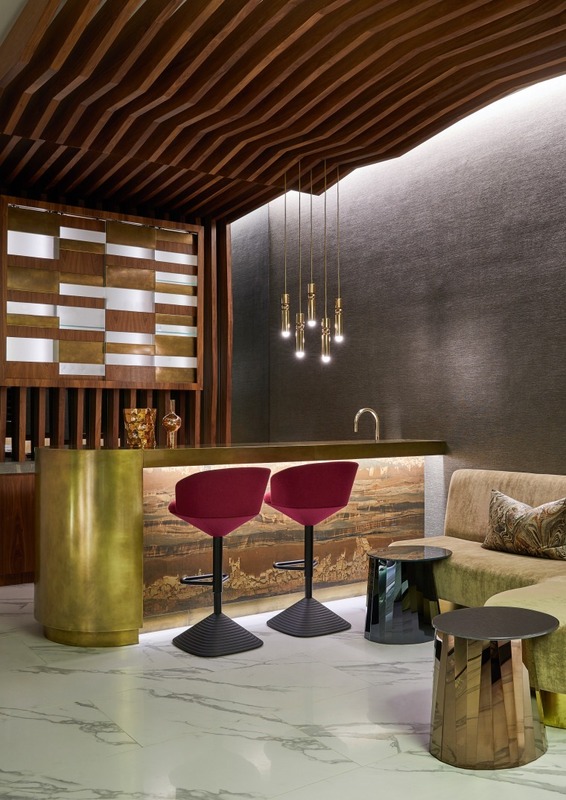 Tom Dixon bar stools and Classicon side tables from Limeline add vibrant colour and light reflection to this intimate hangout. An enclosed terrace can be closed completely for weather protection. 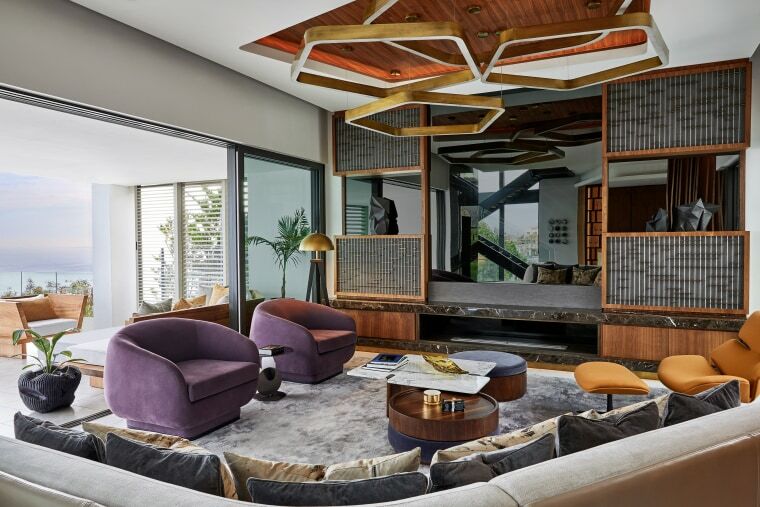 The top‐storey master suite is masculine yet soft.